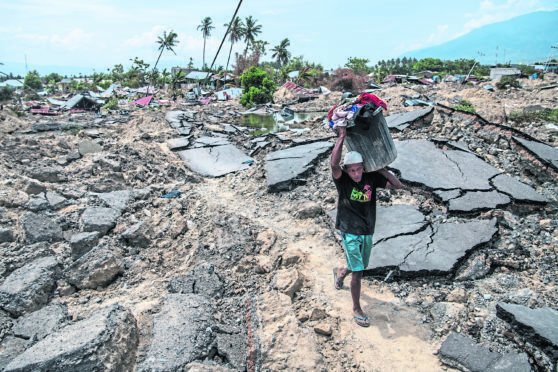 A man carries salvaged items as he makes his way through an area that was completely destroyed by an earthquake. DEC chief executive Saleh Saeed said “devastated communities” urgently required clean drinking water, food, medical care and shelter. He said: “DEC member charities and their local partners are working closely with the Indonesian authorities to get aid to those who urgently need it, as well as helping survivors to cope with the trauma of the last few days. The United Nations Office for the Co-ordination of Humanitarian Affairs says there are nearly 200,000 people in urgent need of assistance, about a quarter of them children. The UK government said on Tuesday it would send a transport aircraft filled with urgent aid to Indonesia. International Development Secretary Penny Mordaunt said thousands of shelter kits, solar lanterns and water purifiers were being sent to the disaster zone. DEC showed its appeal on major UK television and radio stations on Thursday.